Nicole Benveniste | Mixing it up – Can’t our metals get along? Mixing it up – Can’t our metals get along? So you’ve fallen in love with that antiqued brass faucet. Guess what? So have we! But then you begin to wonder: will it go with my polished nickel hardware? We say, mix it up. It’s a little like the day you realized you were going to have that platinum wedding engagement ring and wedding band (hopefully) forever. Did you let it stop you from wearing your favorite gold bracelet or those fabulous brass earrings you got on that trip to Morocco? Of course not. Mixed metals are a definite (I) do. I suggest pairing two main metal finishes in the same space and repeat each finish at least twice to give it some presence. 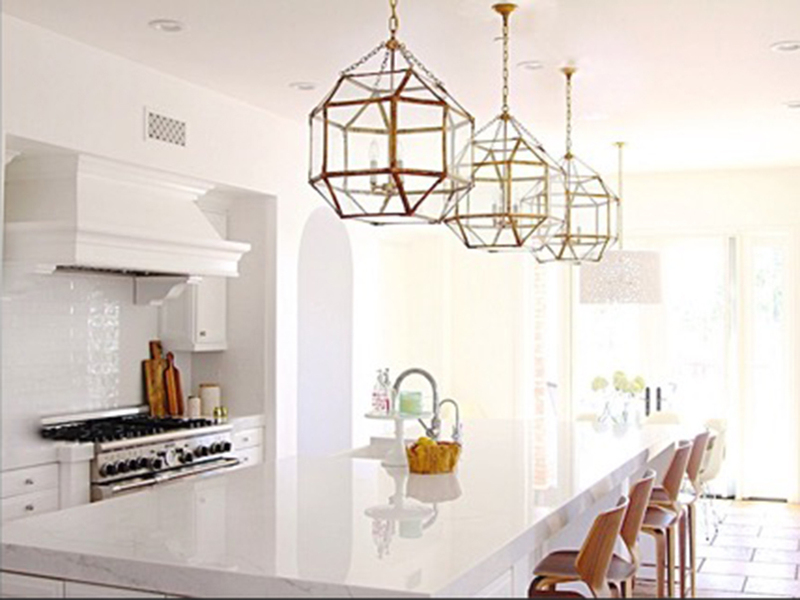 This gorgeous kitchen uses silver tones on the faucet, appliances and cabinet hardware and warm gold tones on the 3 large pendants. The master bathroom in this Mediterranean Tudor embraces hand forged bronze light fixtures, oil rubbed bronze cabinet hardware and warm polished nickel for some sparkle on the traditional plumbing fixtures. Beautiful!